Furzton might not have been on top form for Sunday's charity open – but the event did raise £460 for the children's speech therapy department at MK General. Ever the star, Mike Buchwalder took top spot with 36-15 of bream on the tip followed by Terry Davies on 27-9 as Maurice Williams had 24-9 and Pete Patton crept into the top four with 23-11. The prizes included one for best roach weight, and Steve Davies claimed that with 14-11 of redfins. Organised by Paul Chapman, with help from Kevin Osborne, the match was a 42 peg sell-out. NO matter others weren't doing so well elsewhere, Chris Denton had quite night on Lodge with eight doubles from a dozen runs. Ben Hewer had an extremely photogenic 16-6 fully-scaled mirror from Tear Drops and Terry Martin a 13lb mirror as Graham Cook had four carp to 14-2 on Newport's Big Pit. A better result in some respects was Nikki Bolton's 16lb common from the canal near Three Locks. 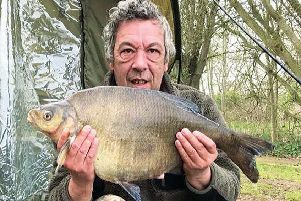 Bradwell Lake Regular Radik – reporting through Willards – has boosted his tench PB to 7-8, and Chris Sawbridge had Big Pit bream going 7-10 and 7-6. Ian Burt, reported by Waters Edge, had a nice bream and silvers net from Linford's Canal Lake. Getting out on the Ouse early, before the sun comes up, Phil Mapp continues to net 5lb+ chub. Dominic Carolan had a nice brace, too. Stalking chub Matt Jones spotted one disappearing under a weed clump, dropped his paste in where he thought it would emerge...and landed a 5lb+ bream. ALDERS midweek open: Charlie Lancaster 324lb, Lee Newson 280lb, Pete Archer 217lb. TOVE Valley, Lakeside: Mark Morgan 110-9, Bryn Wignall 72-14, Andy Jones 58-8. KINGFISHER, Three Islands: Neil Richardson (three wins from three) 97-4, Andy Holdaway 63-7, John Robison 63-3. MK Vets, Furzton: Phil Bardell 37-4, Ernie Sattler 25-6, John Hewison 23-8. CALVERT, Itters Pit: Dave Lewis 30-9 inc a 14-2 carp on 2lb bottom! Ben Holdaway 22-3, Ron Hollier 11-12. DATS evening series last leg, Tear Drops: Paul Keal 13-10, Lee Jones 8-5, Nigel Steel 5-2. Ernie Sattler series winner 109 points, five ahead of Lee Jones. OLNEY, club Ouse: Pete Hawley 10-9, Rob Jolly 1-10, Dave Walsh 1-1. LINFORD, 'Morgan canal: Ron Dorrill and Nick Barker both 3-8 from end pegs... Steve Funnell 2-8. FIXTURES: Saturday MK individual league 4th round, Lodge Lake, 01234 713144; Sunday Sherington Bridge Ouse open, 07795 068428; Tues Aug 8, Olney Ouse open 01234 240061.